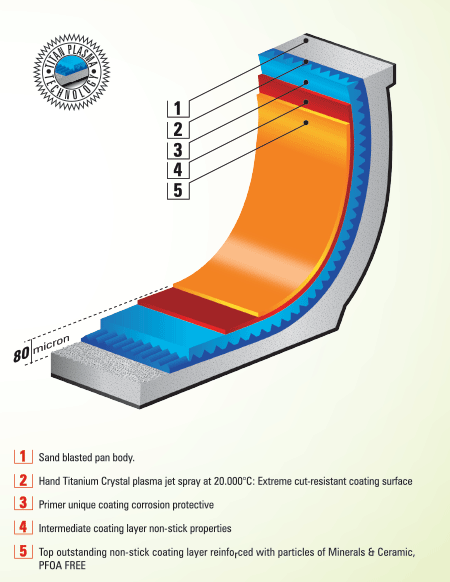 Titanium hard – base reinforced non – stick coatings are known for being up to 40 times more durable than traditional non – stick coatings. A high technology process uses a plasma jet at temperature 20.000 °C to fire a mixture of aluminum oxide and Titanium dioxide onto the surface of the pan at a speed of Mach II. The plasma jet defines a gas that is brought to such a high temperature that it ionizes and becomes electro-conductive. Powdered particles are injected into this beam, melt and are fired at a speed of mach II onto the surface where they form a thick coating. Since the plasma forms at the peak, the underlying material remains cool. This creates a ceramic surface firmly bonded to the underlying material with an extremely high degree of hardness of between Rc 60 and 63. 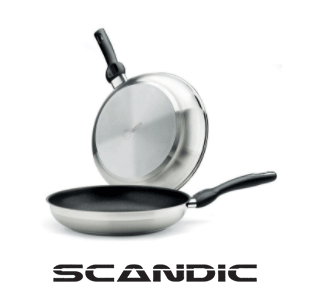 This flamed ceramic base is then given a triple layer of non – stick coating, specially developed by Lumenflon. The seal is boned between the pores of the rough surface of the ceramic layer at a temperature of approx. 430°C. 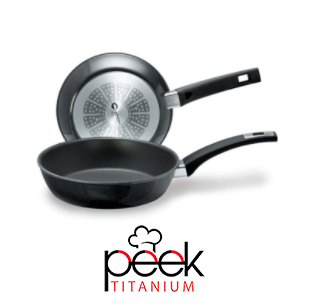 Only a small part of the non – stick coating- the part which is outside the flamed ceramic peaks, can wear and hence cuts and scratches can be seen on the surface. However, most of the coating is between the pores on the rough surface. The incredible toughness of the ceramic peaks protects the sealing between the hard ceramic peaks so well that it can only be destroyed by rough and incorrect treatment.